Ofelia de La Valette and her children, Paulina and Erik, are an amazing example of a family who work together to create something bigger than themselves. Their story is one of grit and determination but also one of vision and passion. The idea of dance 101, a one of a kind dance studio that welcomes and nurtures dancers of all interests (recreational to professional), all levels (brand new to highly experienced), and all ages (18 - 80), was a dream in Ofelia’s imagination about 25 years ago when she began her dance studies as an adult beginner student at 34 years of age. A highly unlikely dance trajectory, Ofelia’s journey from beginner to professional dancer began at a local gym in Atlanta, when she stepped off a treadmill, and followed the pounding beat of dance music into a Cardio Funk class. She eventually mastered the classes at the gym; found a local dance studio and started taking classes from dance professionals. “I was the worst in the class and I often wished there was a studio for someone like me: an adult newcomer who needed a nurturing, accepting environment to learn in.” For the next 10 years, Ofelia was in a period of intense study, working a corporate job and raising Paulina and Erik while taking 10-12 classes a week on average. After a decade of intense study, Ofelia started receiving invitations to sub classes and that eventually led to her being awarded her own classes to teach. Her specialty was teaching and inspiring newly minted dance students - many of whom would later develop into formidable dancers under her expert tutelage. At the time, dance 101 was a pioneer in the concept of introducing dance to adults, and Ofelia is proud that it was the first of its kind in the country. Further cementing the uniqueness of the studio, dance 101 puts on three shows a year which are inspiring showcases of amateur dance talent being cultivated at the studio. In 2017, Billboard magazine recognized dance 101 as one of the top 10 dance studios in the country. With two locations (Atlanta and Alpharetta), today dance 101 employs 53 teachers, offering about 140 classes a week collectively. It has come a long way from its humble beginnings as a one room studio in 2004. Paulina, Ofelia’s daughter, was attending SCAD in Savannah studying graphic design when her mom first reached out for help with the studio. “Initially, [my mom] needed my help designing the class schedule. From there she kept asking for my help, putting my design degree to work creating ads for local publications, designing posters to announce new classes which then evolved into web design and actually pioneered the now industry standard of using class banners to promote classes. Then one day, I got THE CALL. The studio had taken off and she needed my help. I was a junior at that time. I knew what she was doing - how she was bringing joy to others through dance - and I knew she needed me. So I packed up my things, said goodbye to my friends in Savannah, transferred to SCAD Atlanta and moved back home to help her.” That was in 2005. Today, Paulina is the Director of Programing for the Atlanta studio and Visual Marketing for both studios. “My position has evolved so much since my college days. From marketing to teacher management to show producing to blog writing to working the front desk to the occasional graphic design — yes, I still update the class schedules!” She is as passionate about the business as her mom, and with her brother, are the future of dance 101. Ofelia’s son, Erik, similarly got into dance 101 after school at SCAD in Savannah, where he was majoring in sound design. After a year and a half, he decided to change directions, knowing that a career in sound design wasn’t for him. He took a part-time job working at the studio, and it drew him in. He discovered how much he enjoyed working with his mom and sister, how strongly he felt aligned with the mission of the studio and that he had an affinity for running the financial side of the business. He transferred to Mercer University, majoring in finance. “There’s a maturity and wisdom to Erik’s studies because he’s in the trenches - everyday brings opportunities to put into real practice what he is learning at school. But even more than that, Erik’s greatest contribution to dance 101 are the relationships he forms with our members. His easy going manner and big heart is so popular, many will wait longer to check into class just to have the opportunity to interact with him for a few minutes. Paulina says she’s “chopped liver” when she works the desk with Erik. This always makes me laugh!” says Ofelia. 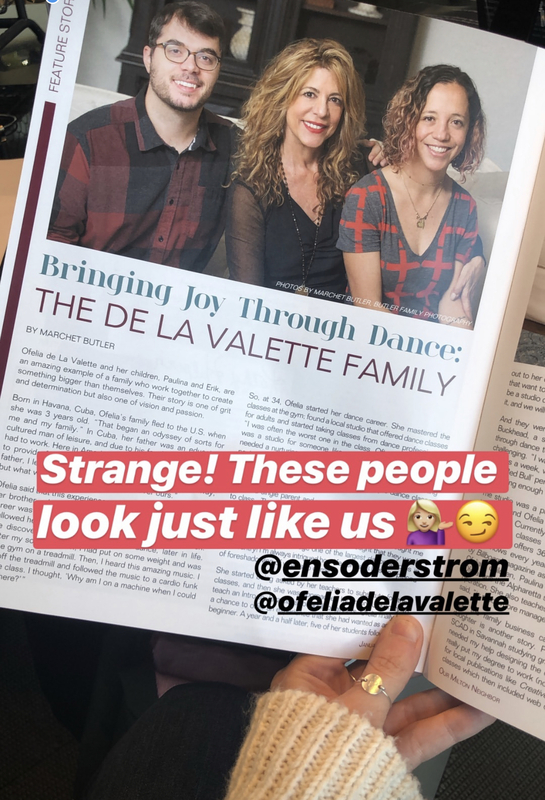 The de La Valettes have an extraordinary connection to each other: working together, playing together, and spending time as a family. Every Friday, when the studio is closed, the family plays kickball together on a team called “Friendos” and they are always taking business. It’s a mission that excites them and brings them together, and one that has touched the lives of tens of thousands of students throughout the Atlanta and Alpharetta area.